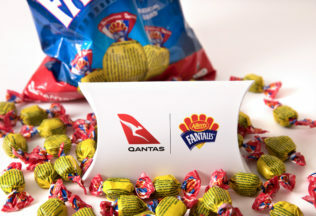 Provided to passengers on select international flights, the Qantas Fantale includes the Qantas logo on the lolly wrapper, along with special Qantas themed trivia. Executive Officer at Nestle Professional Business, Scott Stuckman, said the collaboration represents Nestlé’s aim of listening to its customers and creating unique opportunities for them. “We’re proud to be partnering with Qantas and developing a lasting partnership with significant long-term growth opportunities,” Stuckman said. There is 32 Qantas history questions on the Qantas Fantales that are available now on Qantas 787Dreamliner flights from Melbourne to Los Angeles. The Fantales will also be available on Qantas flights between Perth and London from 25 March 2018.